In music whenever two disparate elements are mixed together you would expect a lack of cohesion. Something too x mixed with something too y. But these forces are often complimentary—a certain hardness, for instance, helping to underpin uncontainable jelly softness. This is the case in 'I Agonize Myself', a wonderful morsel of music that illustrates its title with self-torturing million-miles-an-hour thoughts in the form of a skittering tumble of beats, a landslide sped up five, ten times as fast, burying the self on its winding road through life with worries and wants. These are the foundations of breakcore: inhuman beats that twinge and judder, cut and re-cut and delayed, messed-with beyond the realm of regularity for the ultimate in what the addled mind desires. But in clear opposition to these theatrical swarming insectoid beats, Laxenanchaos, the musicmaker behind the track, summons a sea of music that with strings and synthesised sound spin slow melancholy crooning lamenting, the steady swirl of clouds spellbound grey and white and the spluttering rapidity of the rain below. A vocal sample later in the track narrates the emotion behind it all. Whilst the whooshing orchestration paints thickly and expansive an undeniable sadness, each peal and strain of melodious sound infused with heartache and downcast feeling, passive, the barrage of beats is aggressive, active, a jitter of attention-splitting details, pockmarks and craters of anxiety: the unrelenting internal monologue. The track grows in intensity as it rolls onward through our minds, beginning with real-world sounds, the sweet sentimentality of birdsong, and grows, rushing into a hurricane until around 2:38 when the kick thuds with more bass than before, bumping the track into a new realm of feeling. We end up in a thicket of bristling ambience, fading once more into the innocuous real world sounds of breeze in trees, birds singing. 'I Agonize Myself' in this way represents the little storms we go through each day; how in real life we can be going about our business in any setting – shown by the found sounds that book-end the track – and be suddenly beset by the gravity of emotion, the sudden tumult of mental illness. And we join the calm and crash of Laxenanchaos, our own feelings mirrored, our noxious negativities compounded, condensed, and then let loose in an LHC of emotive noise, both illustrating and providing even just a moment's respite from ourselves. 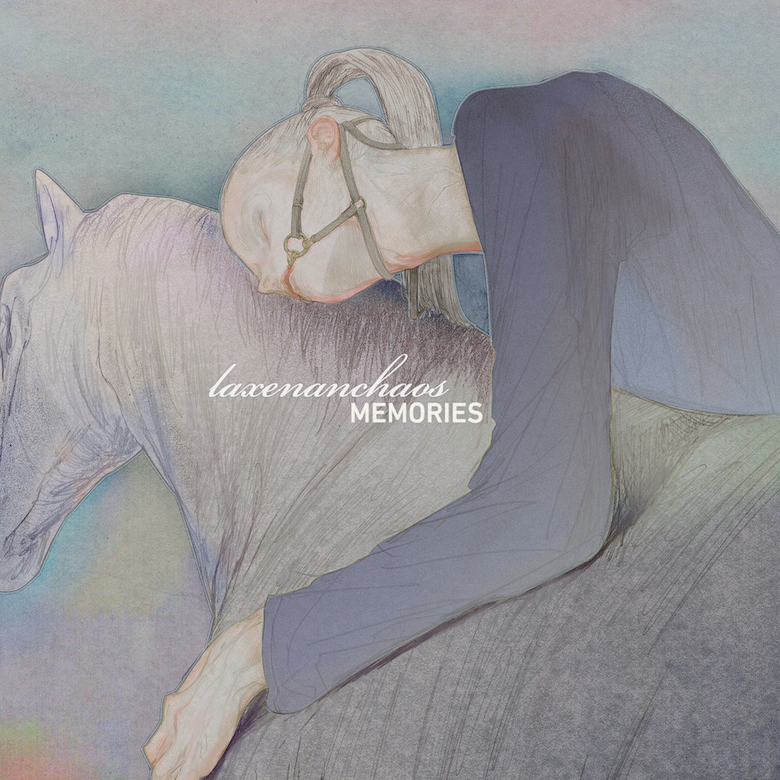 🔔 This incredible track, which originally surfaced in 2015, is taken from Laxenanchaos EP MEMORIES, which can be attained in the form of a free download from Bandcamp courtesy of Virgin Babylon Records. As the label themselves state in the description of the EP, the musicmaker himself "invites you to feel catharsis from chaotic emotion." 🔔 The artwork for MEMORIES, at the top of this post, was created by Osaka-based illustrator mieze. It depicts a girl hugging a horse, drawn in unreal melancholy pastels. Often a symbol of unrestrained freedom, and in this case perhaps a representation of the girl's own freedom, the horse is free from tack, is riderless, whilst the girl herself is fettered with a bridle. The hug itself, a deep closed-eye embrace, seems emotional enough to be a farewell. It may also be important that the girl's hair is styled in a ponytail: the name of the style is enough, but the fact that this is a way of taming hair by tying it up suggests even more lack of freedom for the girl. The EP's title, "memories", seems as though it is reflected in the artwork—indeed, instead of a current freedom that has been let go, it may well be that it is the freedom of the past, childhood, which is the recipient of this goodbye. The horse in question is actually quite a lot smaller than the girl, maybe suggesting that it isn't fully grown and that it does represent the passing of childhood, the loss of that much freedom, and moving into adolescence and adulthood whereby the individual is bridled not just by society, school, work, but by oneself as a reaction to these facets of life.